14 3/4" x 19 3/4"
Jim's wife Liz found Jean Merwin's painting "December" on St. Croix in 1997. The bright, exotic flowers set against the spare, white cottage drew us in. 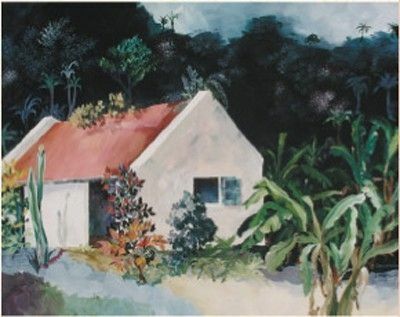 Jean was a self-taught painter who moved from Pittsburgh to St. Croix in 1956. She said she felt it was one of the best paintings she had ever done.